Breezy Town Pizza | Seattle's other best Chicago-style pizza, or midwestern pan pizza, or whatever you want to call it. Breezy Town Pizza is Midwestern pan pizza, Windy City Pie’s younger sibling. Since starting Windy City Pie, we’ve had the opportunity to make a lot of pizza for a lot of people. A huge portion of those people are Chicago-area natives who come to us with hopes of some nostalgia of their favorite pizzeria from their past. 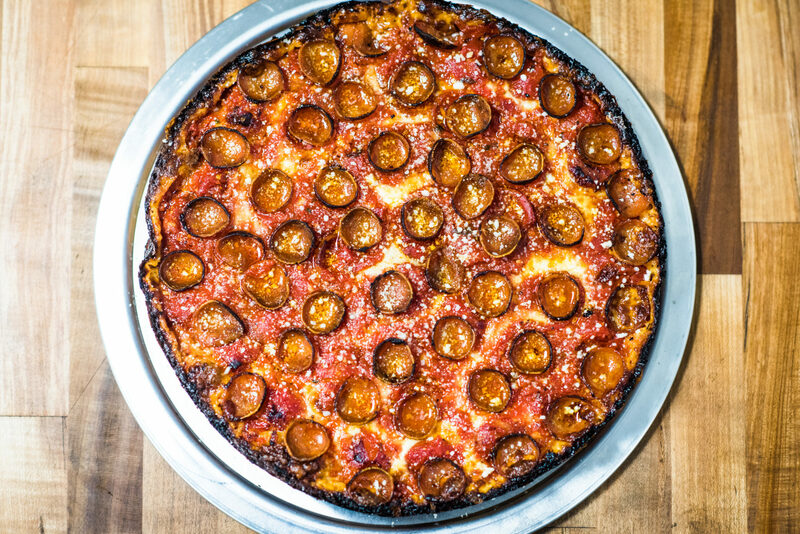 If your favorite pizzas were from Papa Del’s, Pequod’s, or Burt’s our pizza brought back obvious memories and went in exciting new directions. The driving force has always been making the best pizza we can and if that means challenging some norms, that’s cool with us. Why not another Windy City Pie? Instead of identifying as a very particular style of pizza, Breezy Town Pizza doesn’t limit itself to being exactly Chicago-style or Detroit-style. Breezy Town is meant to poke fun, to remind us you can be authentic to your roots while taking a cuisine in a direction it hasn’t yet gone. Amazingly delicious results are what matters above all. Our initial menu will be a Chicago and Detroit inspired deep-dish pan pizza with the sourdough we’ve been working on for a year, featuring a blend of mozzarella and Wisconsin Brick Cheese. Of course, we’ll have that same cheese edge that is the cornerstone of Windy City Pie. We’ll start with a smaller set of toppings, some new, and some crossover from Windy City Pie. We’re so very excited to share this new menu with you.